If you believe in God, you have to believe in the Devil. 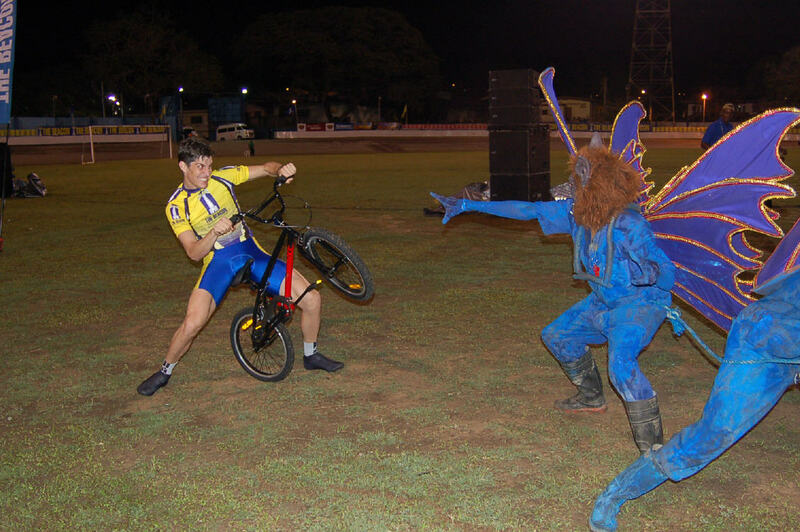 And I’ve seen him – and one of his neebz – down at Skinner Park Velodrome in San Fernando, Trinidad & Tobago. Frankie dances with the devil. But that was in the dark of a Saturday night – it was daylight when Pan Am keirin champ, Giddeon Massie; six day stars Donadio, Lampater, Marvulli and Muller; Olympic madison champion, Perez; Swiss amateur, Dominique Stark; Dutch Rabobank girl, Carola Groenenveld; Peter and me clambered into Main Man Arnold’s wheels. It’s a ‘maxi taxi’ – that’s mini bus to us. 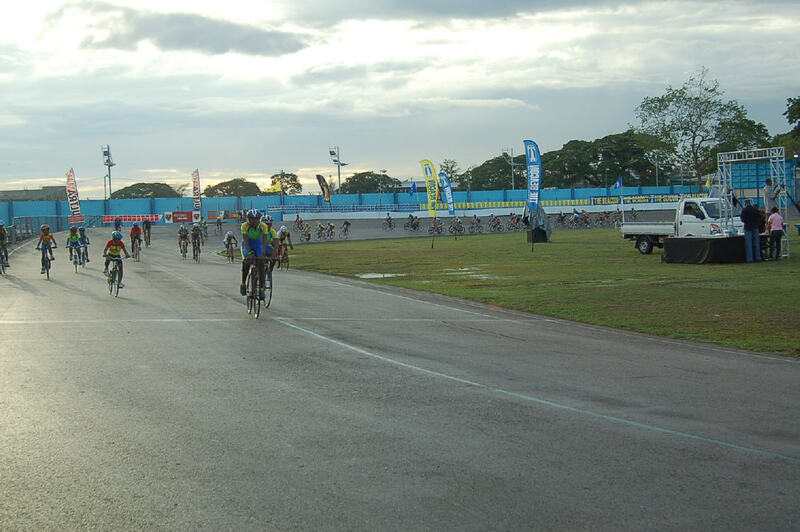 Destination San Fernando and the first track meeting. The bikes were in a pick up, the other guys were in another maxi and the plan was that everything comes together down at San Fernando. There are a lot of cars on the roads in Trini; up until around ten years ago there were regulations which prevented the import of second hand cars. When this regulation was abandoned, enterprising businessmen started to import boat loads of cheap second hand, Japanese cars and virtually over night, the roads went mass critical. On the way out of Port of Spain there are ‘chop shops’ where crashed cars are cannibalised; they keep the good bits and wait on another wreck with suitable, compatible bits, stick them together and eh voila – a new car. Not sure that the DVLA would approve. It rained hard when we were loading the pick up and on and off right up to the official start time for the track meet – 17.00. Rab Chiappa, obviously utterly gutted not be racing yet. But it was a few hours before the first wheels rolled in anger – there were still damp patches on the track at gone 21.30. The track is a stotter, 400 metres with shallow bankings and just one, short straight – draw a circle, slice a bit of the bottom so it looks like a wheel with a flat tyre and you’ve got the idea. I don’t think top Aussie track designer, Ron Webb had a hand in this one. There’s time for autographs then. The only straight on the track is the home straight. Franco was none to delighted about getting up, but the stand was full of paying public and they needed to be entertained. The warm ups were interesting as the ‘mini’ riders warmed up with Franco and Leif. And then the punctures started – Roberto Chiappa blew the rear tyre on Pete’s lovely rear carbon five spoke. First I puncture, then my hair goes a mess… what a night. Then Seb Donadio punctured and one of the Canadians. The light faded, the floods came on, the mega generator fired up and so did the DJ. Pumping dance gave way to the national anthem; I ain’t saying it was loud, but folks stood up 17 kilometres away. Of course we got chicken, man. The riders pass on this. First up for the ‘All Stars’ – after the minis, juniors and ladies – was a 12 lapper. The technique was to race hard in the straight, then try and stay upright the rest of the way. Walter Perez was quickest at the line. The juvenile racing was entertaining; some of the young Trini lads are rapid at the death. Skinner Park bike racing fans. Mr. Voice gets things pumping. As Pete said, ‘the humidity is like being in sauna with your clothes on,‘ well put. Pete is an ‘A-Lister’ here, ‘who was that guy?‘ I asked him of the local who greeted him like a long lost brother; ‘no f**king idea!’ came the response. 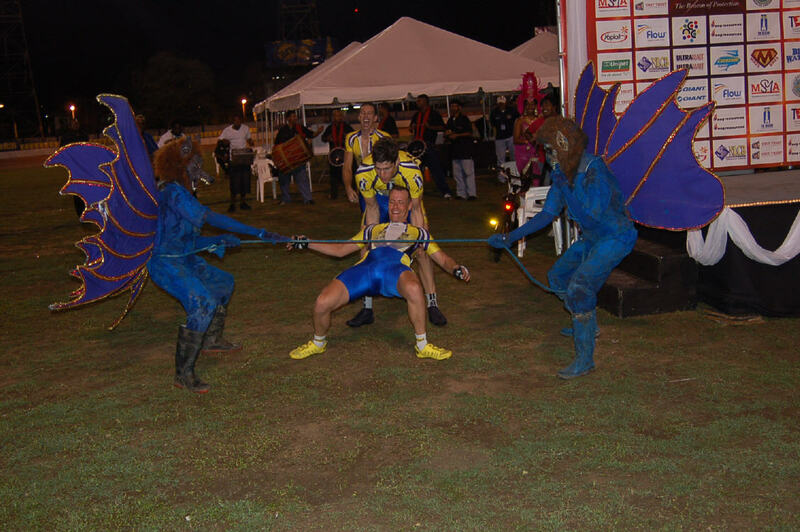 The ‘All Stars’ devil was great, the ‘Demon’ held on a tether by an equally scary beast prowled the home straight to a voodoo drum beat pointing out the rider that they were taking, each lap. The De’il taks the hindmost. It was great entertainment, won by Franco from Leif and Home Boy Emile Abrahams. Emile loves what he does. As well as being a good road and track man, Emile dances a mean limbo. More vets, juniors, ladies, a ten lap won by Leif – on a softening tyre. The interval saw us treated to singer, ‘Superman’ – complete with cape. The big event of the night was the 45 lapper, with $2000 TT on the line for lap one – but, the rider had to finish on the same lap as the winner and within 15 seconds of him. Preparing to snaffle himself two grand. Ex-cycle courier Zak, formerly Pittsburgh but now out of Portland – it’s a tad confusing because he has “Pittsburgh” tattooed across his back in the style of a huge Campagnolo logo – took the dosh and hung on. Franco animated early, Leif animated late and my six day boss still had the strength to take the final sprint from Argentian Pagliari and a local junior. The podium for the endurance race. I took Franco’s bike after the finish – force of habit. Franco explains to Ed how it was done. 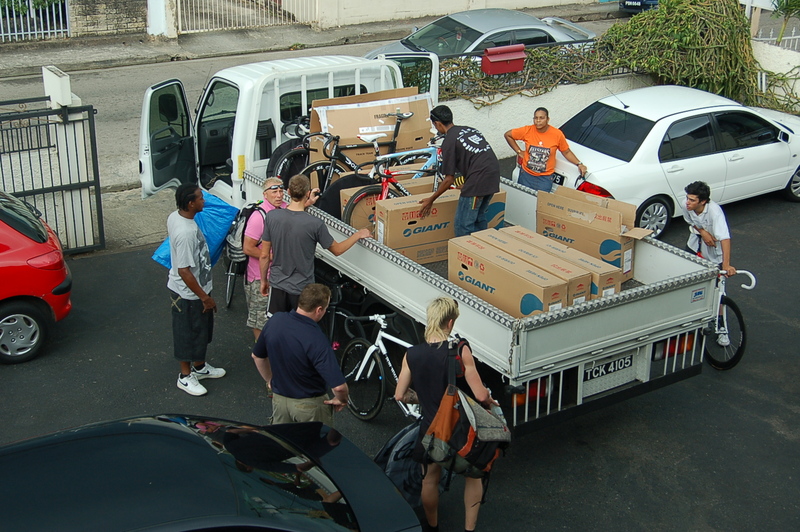 It was nearly midnight when the pick up truck rolled on to the track to collect the bikes. Arnold tells Pete ‘we gotta go home’. Previous articleTrinidad & Tobago – Day Four, Walter Perez goes for Ice Cream!